A new product which has been put to the test is the Poresolution by Dr.Brandt. I've heard of Dr.Brandt but never tried the brand before, I always find it exciting when you try a new brand. I have combination skin with a typically oily t-zone, but with dry area on the face. I must admit I am lazy with toners, I think it's because I've not found the right one. I do enjoy using facial mists, I find them very cooling and refreshing and great for the hotter months. But there's something about the Pores No More Clarifying Lotion*, it's helped to balance my skin. It doesn't make the drier areas of my face drier but it helps to control the oil in the areas it needs it most. It very gently clarifies the skin, exfoliating it and cleaning at the same time. Have combination skin can mean it can look a little sluggish at times, it's trying to find the perfect balance for the oily areas and dry areas. It contains Tea Tree oil which is renown for it's natural antibacterial properties, the other added ingredient which is becoming a favourite of mine is Salicylic acid. The Salicylic acid rids the skin of dead skin cells and works to refine pores. I use this every evening and some mornings, it depends on how my skin feels in the morning. If you have oily/combination skin and suffer from breakouts you need this in your routine! 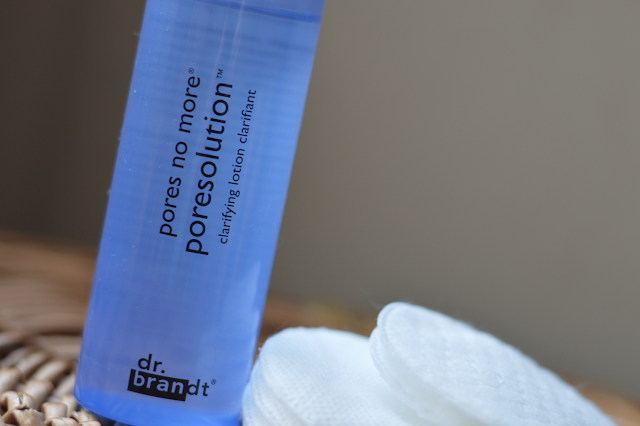 I've already noticed my pores shrinking and looking less visible, some days I don't need to use a pore primer prior to my base routine. The only factor which may put people off is the price, it's 140ml and will set you back a whooping £30.00! If you're a big skincare fanatic and you're struggling to find something to help with you pores and oily skin this may well be worth every penny.